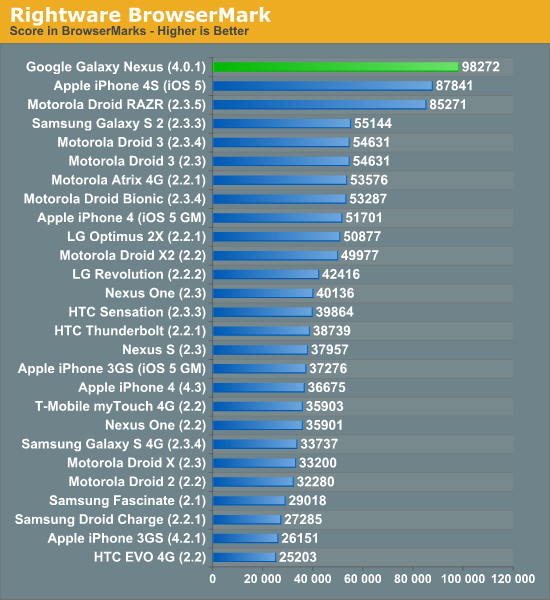 Early web benchmarks for the Galaxy Nexus show that the flagship smartphone outperforms Apple's iPhone 4S in some areas, while Apple co-founder Steve Wozniak has been spotted picking up a copy of the Galaxy Nexus at Google's headquarters. Google has packed the Galaxy Nexus with the Texas Instruments OMAP 4460 processor and the Imagination Technologies PowerVR SGX 540 GPU. 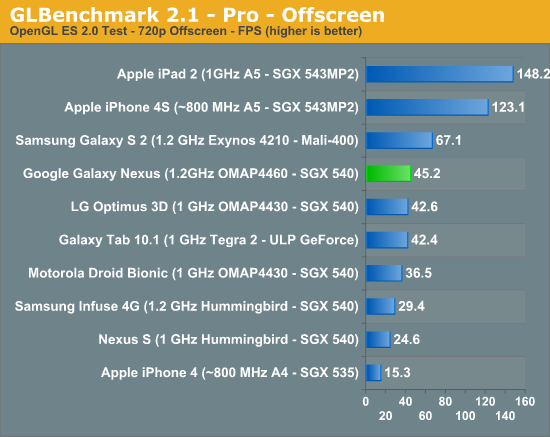 According to the report, its CPUs are clocked "noticeably higher" than the iPhone 4S' own 800 MHz processors. 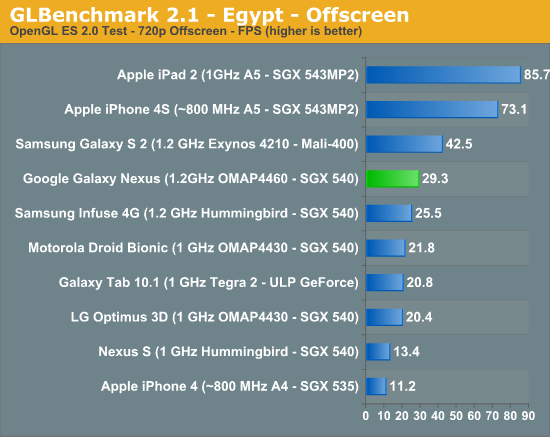 Apple's latest smartphone did outperform the Galaxy Nexus in the graphics department, however, as evidenced by the GLBenchmark 2.1 Egypt and Pro tests. The iPhone 4S makes use of the A5 processor, which makes use of the dual-core SGX 543MP2 GPU from Imagination Technologies. 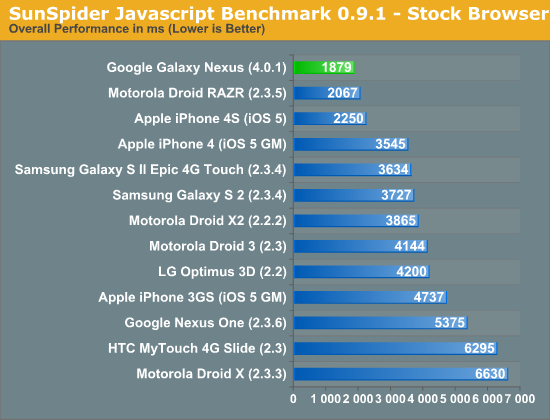 "Google really pushed the performance of its software further with Ice Cream Sandwich, while GPU performance is limited by the SGX 540. The good news is that there's more than enough hardware at ICS' disposal to deliver a smooth experience," the report concluded. Google and Samsung unveiled the Galaxy Nexus and the upcoming Android 4.0 update, dubbed Ice Cream Sandwich, at a press event in Hong Kong last month. A U.S. launch for the device was slated for late this month, though recent speculation suggest that it has been pushed back to December. MacNN reports that some early adopters of the Galaxy Nexus are have encountered a volume bug with the device. Users have nicknamed it the "Self Aware Volume Ghost," as the flaw is said to randomly lower volume on the handset and sometimes prevent users from turning it back up. It's possible that the bug has contributed to delays of the device. Wireless operator Vodafone said on Saturday that it is "continuing to test" the handset's firmware and plans to release the phone once tests are complete. The Galaxy Nexus hasn't arrived in the U.S. yet, but Apple co-founder Steve Wozniak, also known as "Woz," has already got his hands on one. Android browser engineer Nicolas Roard reported via Google+ that Wozniak had been spotted picking up the device on the campus of Google's headquarters in Mountain View, Calif. According to MacNN, Wozniak was invited to pick up the device after he posted on Twitter that he was looking for it at Best Buy. 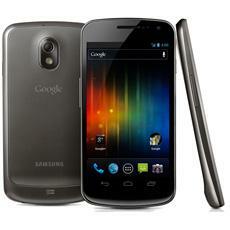 Recent rumors suggest that Verizon will launch the Galaxy Nexus on Dec. 8. 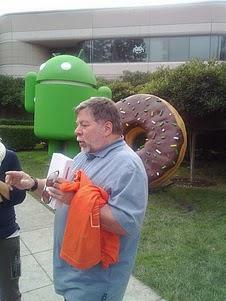 Though he has expressed a growing interest in the Android platform, Wozniak also remains an avid iPhone user. Last month, he was first in line to purchase the iPhone 4S at an Apple Store in Los Gatos, Calif. Unlike with his recent Galaxy Nexus acquisition, Wozniak said that he wanted to get the iPhone 4S at the same time as other enthusiasts. "I want to get mine along with the millions of other fans," Wozniak told CNN while waiting in line. "I just want to be able to talk to my phone." In fact, Wozniak has admitted that his keen interest in cell phones sometimes leads him to carry as many as 10 different phones with him.